Sister ship to the Superfast I, Superfast II is the newest vessel of the Superfast ferries fleet. Built in Italy in 2009 it can hold up to 928 passengers, is 8 decks high and accommodates 700 vehicles. On board you will find modern facilities such as, an indoor bar, self-service restaurant, casino, games arcade and a shopping centre. Please Note: Whilst we have taken great care in making our Superfast II guide as accurate as possible, onboard facilities, services and entertainment may vary depending on the date and time of year that you travel, facilities mentioned may change without notification and ferry companies reserve the right to operate vessels other than those mentioned at time of booking without prior notification. "Good trip, but more organisation at the port is required." My main gripes are with the vessel and the port, which was seemingly total chaos on the dock side at the entry to the boarding area. All sorts of vehicles were parked all over the place with no form of organisation or order that is common at most ports. Also it would be a good idea for some form of signage to be displayed for first time users to know where to collect their tickets. That is a large failing. The trip itself was as expected for deck space. My main complaint about the ship was that one of the escalators was out of action and my wife has major breathing problems having to climb the stairs, and disabled people also suffered major difficulties. The other complaint concerns disembarkation, where once on the top vehicle deck there were no signs to the lower deck levels and many people were wandering around among all the obstacles, blocks,cables,chains,grease/oil etc.Very dangerous. If these points were eliminated it would be a 5 star service. Crossing perfectly on time with Superfas-Ferries. 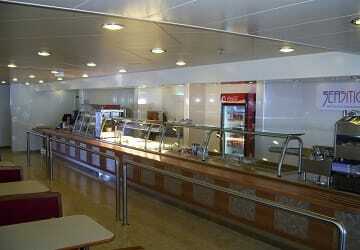 Ticket collection arranged by Directferries, trouble free! One thing: We didn't book airplane seats, very nosiy last year, fellow passengers going to the toilet in the middel of the night and slamming doors. This time we slept on a sofa in the restaurant! A cabin is not in our budget, too expensive! 65+ discounts possible?? A very good service from Patras to Bari but the price of the cabin accommodation is very high for the facilities provided. 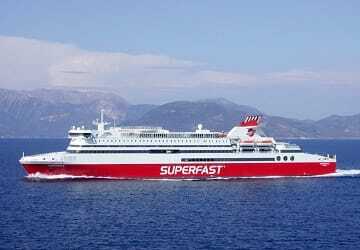 We have travelled twice on Superfast (Bari to Patras and Partas to Bari) on both trips the service was very good, staff friendly and helpful and the cabins clean and comfortable. We would travel with them again. It would be nice if there was a sit down waiter service restaurant instead a self service. "A pleasant way to travel"
We travelled overnight from Italy to Greece and decided to take advantage of a cabin. 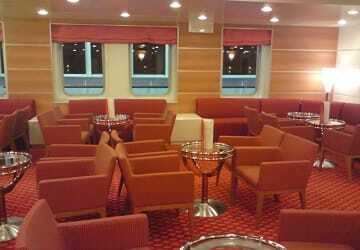 We were warmly greeted as we came on board and quickly shown to our small but comfortable and well presented cabin. Service throughout the trip was very good and we would definitely travel this way again. Congratulations, the organisation was very good. Please respect departure and arrival times. "A crossing between Igoumenista and Bari"
I've been taking the 'Super fast' for years for different kind of crossings (Patras, Ancona) and I must admit that this maritime company is the illustration of dilligence, the expertise, the reception, the relations with the staff, the cleanliness are excellent. An effort should be made on punctuality though. "Great way to travel to/from Greece"
I've travelled on this route several times, and each time I've enjoyed it. The staff are courteous and competent and the food is exceptionally good. This time I didn't have a berth (to avoid being in a cramped cabin with strangers) and managed to sleep well on a bench once the commotion of the passengers embarking at midnight (in Igoumenitsa) had died down. "All in all okay! " "Toilet cleanliness leaves much to be desired and expensive drinks prices. Ride The price however was perfectly fine. It should anyone expect a luxury, if it is "normal" "Crossing the bay." It may happen that one crowded with many people to sleep on the bistro furniture. Well suited for backpackers! "